A SHORT GUIDE TO UNDERSTANDING EXCURSION INSURANCE. After receiving dozens of questions from tour operators around the world about Excursion Insurance, we have put together a short guide to understanding Excursion Insurance. What are A.M. Best Ratings? 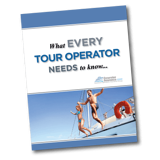 Fill out the form to download “What Every Tour Operator Needs to Know About Excursion Insurance“.